**Okay, so I was going to time release these posts as to not overwhelm everyone now that I have service, but I’ve had so many requests to release them all at once that I’m going to go ahead and send them out ASAP. Take your time and enjoy all the pics and videos cause I’m headed out for another 7 days without service probably. Enjoy! Today was quite a day! We had to do about 20mi to set us up for sunrise summit of Mt. Whitney the next morning. Normally, that would be a relaxing day for us and we hoped to get done fairly early…but this is officially the Sierras now! What we didn’t expect was that with the high snow year this year, 3/4 of our hiking today was in snow and there was no sign of the trail most of the time. It was so crazy that I almost called this entry Route Finding: 101. In the morning, we were up on a hill and saw a group well below us. It was Liz, Skinny D, Funyon, and Meow Meow. They had left Kennedy Meadows the day before us, so we were surprised to see them. The trail and the snow had been a lot more difficult than any of us expected, so we ended up catching many people who had left a day ahead of us from Kennedy Meadows. Most groups are not as early starters as we are, so they have less daylight for these unexpected hurdles. That group took a round about way and we were able to talk to them as we were taking a break after a difficult climb. They said so others who had also left KM the same day as them was in the general vicinity and had camped with them last night. We moved on and later saw them way down below again pretty far off trail. Again, so glad we have Blister! After seeing them we soon came upon Spidey and No Amp(who were also a day ahead of us) who did not have GPS and were very happy to stick with us for the day. 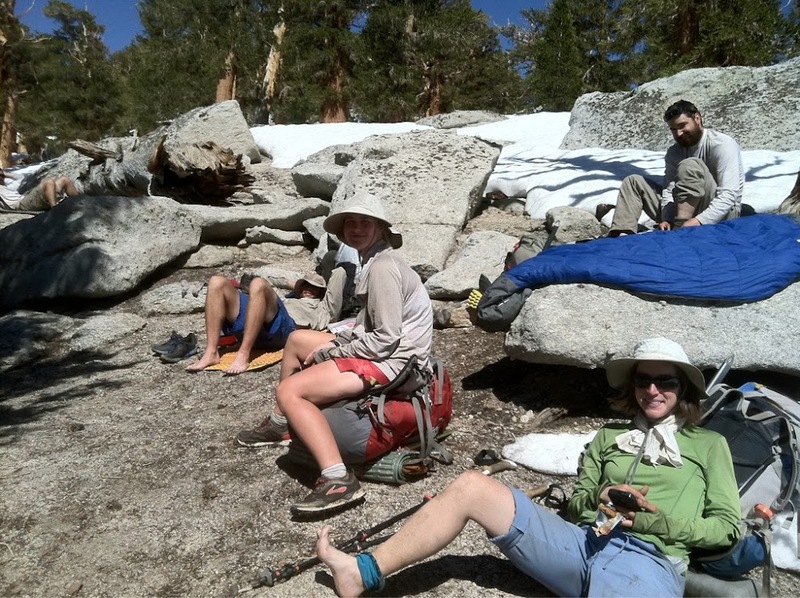 They were running low on food and were unfortunately not going to be able to summit Whitney. Then we found Speedbump who was also winging it and did not get as far as he had hoped after splitting from us yesterday afternoon. The six of us ended up staying together for the day. Here is everyone on a break after a difficult climb. It was quite a tiring experience. We let the young and energized Speedbump and Top Shelf be our trail hounds and lead the way. They were remarkably good at finding the trail. In the afternoon, I had to stop and fix something on my bag. We had just finished a break so I told the group to go on and I’d catch up. I was following what I thought was their tracks and then they looked questionable. I got my GPS on my iPhone with Halfmile maps and double checked. I was off trail! I spent 20mins trying not to panic and found the trail after much scrambling and backtracking. I was concerned I was still off trail because I didn’t see my group and started to backtrack. I turned around to see Meow Meow alone in the same predicament as me separated from her group. Two seconds later, my group came around the corner and we were all in shock. 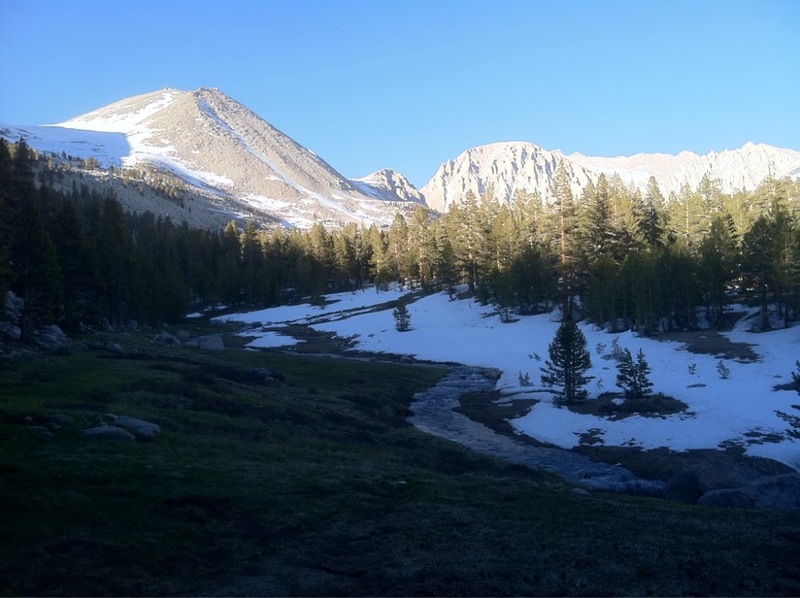 In some crazy way, I was not only on the PCT, but I had jumped ahead of them! The Meow Meow’s group arrived and they were missing another member so we moved on. We had our first serious ford late in the afternoon. Someone had left a note about crossing on a log and I am deathly afraid of those. 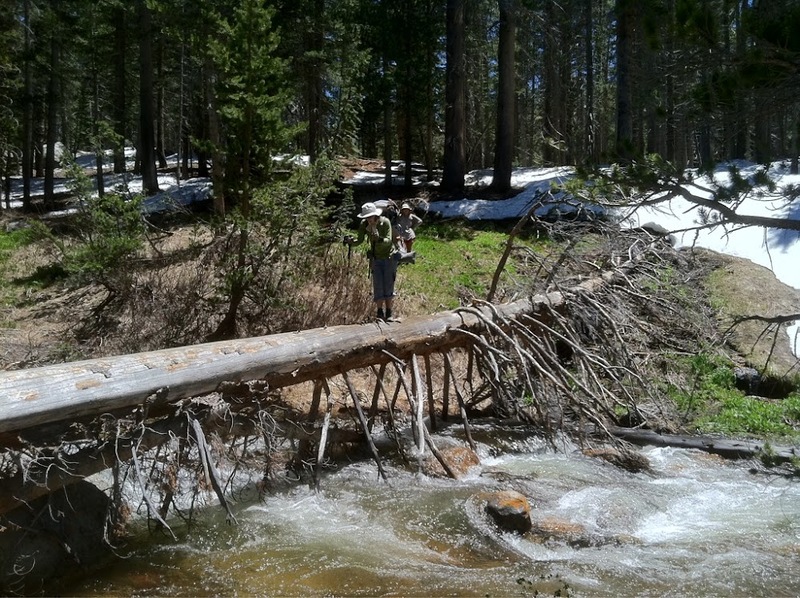 I ended up pathetically crawling on a lower log upstream, but the rest of my group used the log. Here is Spidey crossing. No way for me! After we crossed, we walked downstream to find the trail and found Pounder and Chili(strong hikers who also left the day before us). We leapfrogged with them at the end of the day. From the stream crossing and after a draining day of snow, we had to go up very steep switchbacks. Exhausting! 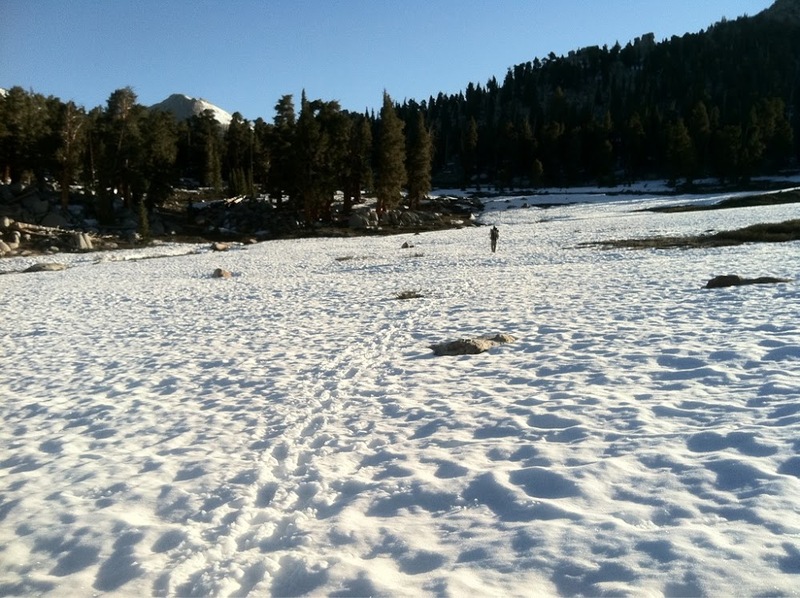 All I could think was that I have mad respect for anyone who has done this trail…especially in a high snow year. Our day wasn’t over yet! We ran into two freezing cold fords at the end of the day that were thigh high and strong. Brrr! It felt like needles! Right before we got to camp, we passed a campsite with team No Babies(who are also very strong hikers who left the day before us). It was Drop Dead, Annie, Pellet, Kylie, and Jams. They were not happy campers. They had mistimed their attempt to summit Mt. Whitney that morning and were postholing the whole way and had to turn back. Now they don’t have enough food to attempt again and are either going to have to skip it or take a convoluted and difficult route after they get into town in a couple days. Speedbump usually hikes with them and was delayed waiting for a package at KM. He had been working hard to catch them before Whitney and you could see how relieved he was that he didn’t catch them. We went another mile to set up camp closer to Whitney and discussed options for tomorrow. Other hikers camped in the area had given us pointers and we were glad to be able to learn from the front runners mistakes. Speedbump and Top Shelf really wanted to be on top for sunrise and it was the night before a full moon, so it was going to be a perfect night for a sunrise summit! I set my alarm for 11:30pm to be ready for a midnight start…we will be summiting Whitney coming off an exhausting day and less than 3hrs of sleep. We are crazy, but we hope it will be worth it! Here is our view of Mt. Whitney From our campsite.